Suzuki's V-Twin DF25 is loaded with high-tech features, like an onboard computer that monitors engine temperature and rpm and instantly sets ignition timing for peak performance. The ignition system sparks hotter, making pull starts quick and easy. Suzuki's 70-degree twin cylinder aluminum block maximizes power while reducing vibrations — without a heavy counter balance. These light-weight design features and a sturdy handle make it easy to carry. THIS OUTBOARD HAS THE GUTS to push a boatload of friends, family and gear making it perfect for duck boats, small fishing boats or RIBs. For lighter duty jobs, bolt on one of our powerful two-cylinder inline DF15 4-strokes. These clean-running, fuel-efficient outboards are engineered to start easily, idle smoothly and deliver all the power you'll need for a day on the water. Whichever tough Suzuki 4-stroke you choose, you'll have a boating partner you can count on for the long haul. 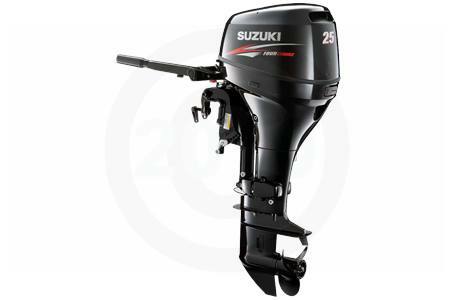 Suzuki's DF25 V-Twin outboard provides the right amount of power and performance in an outboard that is compact and well balanced, making it the perfect choice for small fishing boats and RIBs. The DF25 is compact thanks to a 70? V-angle design that also keeps operation smooth with little vibration. Two cylinders, each displacing 269cm3 (538cm3 total displacement) utilize two overhead valves per cylinder to deliver maximum power output at 5,000rpm. The V-twin layout also moves the center of gravity forward which allows for better balance on the transom and makes the engine easier to tilt by hand. Suzuki's 4-stroke technology delivers clean, efficient operation that conforms to the Ultra-Low Emissions 3-Star rating from the California Air Resources Board (CARB). Both the oil dipstick and filter can be accessed without having to remove the side covers, so checking and changing oil is a breeze. The outboard has a water separator that is built-in—not bolted to the boat—to keep water that might get into the fuel system out of the carburetor. A high output alternator delivers plenty of power to keep all of your electronics up and running even during long hours of trolling. The shift lever is located in front of the engine so there is no need to reach around the side of the outboard to shift. Steering tension is set with a simple adjustment lever and the outboard's lightweight design and sturdy carrying handle make it easy to carry. The engine is covered with two-piece side covers that come apart for easy engine access, should you ever need to get to the engine's components. This model incorporates a number of features that help to guard against exposure to the elements. Suzuki Anti-Corrosion Finish is specially formulated to protect parts of the aluminum exterior that are constantly exposed to e elements. Other features that increase the outboard's durability include forged pistons treated with an Alumite coating for increased heat resistance and a resin coating on the piston skirt for improved resistance to wear and friction reduction, and a water-cooled voltage regulator in the outboard's electrical system. At idle, only the tell tale water jet will assure you that the motor is running. Very low noise allows you to talk normally to your passengers or crew when out on the water. Add to this very little engine vibration and you have peace and quiet to go along with a great day on the lake. The V-Twin DF25 is designed with features that keep operation easy. Digital capacitor discharge ignition (CDI) system provides optimal timing and a hotter spark for easy and more reliable starting. Suzuki uses its own, original Suzuki Anti-Corrosion Finish to guard the outboard against the harmful effects of corrosion. This special formula is applied directly to the outboard's aluminum surface to provide maximum bonding of the finish to the alloy surface. Layered on top are an epoxy, primer undercoat, black metallic finish, and clear acrylic resin finish that together, form an effective treatment against corrosion. Shaft Length: S - 15 in., L - 20 in. Weight: M/S - 152 lbs., ML - 159 lbs., E/S - 161 lbs., E/L - 168 lbs., R/L - 161 lbs. S - 15 in., L - 20 in. M/S - 152 lbs., ML - 159 lbs., E/S - 161 lbs., E/L - 168 lbs., R/L - 161 lbs.